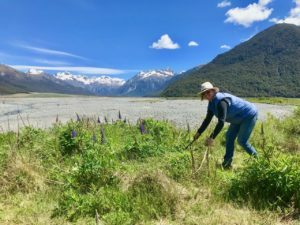 SOC members were recently part of the team that worked for a week to weed out Lupins in Arthurs Pass. They may look pretty, but Russell lupins are seriously impacting our braided river birds such as the endangered wrybill and black fronted tern by taking over their open shingle breeding space and allowing predators hidden by the weeds to ambush the females on their nests as well as take out chicks and eggs. Broom and gorse compound the problem. The weeds also damage a braided river’s ability to move and behave as it should creating further issues. 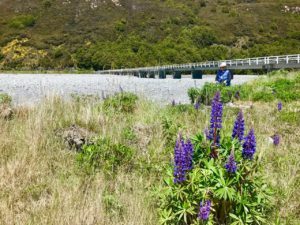 For example during the recent floods in Arthur’s Pass some 150 year old native plants were taken out by the river being forced to flow away from areas unnaturally stabilised by weeds. This year volunteers led by ECO Canterbury (Sustainable Otautahi Christchurch is a member of ECO and this regional network), Conservation Volunteers and North Canterbury branch of Forest & Bird supported by DOC and ECan went to Arthur’s Pass and helped the Arthur’s Pass Wildlife Trust with their annual war on these weeds. The volunteers in 8 days of effort did weed control on over 78 hectares. By the end of the season the APWT will have completed close to 250 ha. Lupin seed in this area only lasts 4-5 years. We can win!